It helps people to get files from others. It is like having an online USB drive and letting your friends and colleagues to put files there so that you can easily grab them. 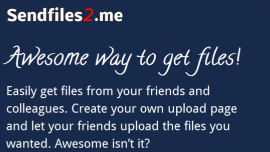 Hey I have just created an invite code for those of you want to try Sendfiles2.me: Try this! You can follow me or say hello to me over @malibey!